GRANAREUNITED 16 was great, thanks to everyone for making it just about the best to date. Can it be bettered? We’re sincerely hope so. 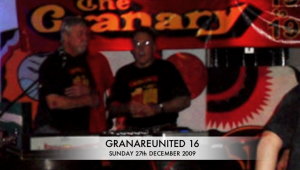 Make a note of the date of GRANAREUNITED 17. Same venue, same line up and same atmosphere. We hope to see you there. There’s just about the best pop quiz in town at the Prom Music Bar every Tuesday. Al Read is one of the regular quizmasters posing an entertaining selection of questions to test your knowledge of pop & rock over the decades. There are cash prizes to be won plus prizes of drinks and t-shirts and other goodies. It’s just £1 per entrant and you can form a team of up to six persons. Go on. give it a try. 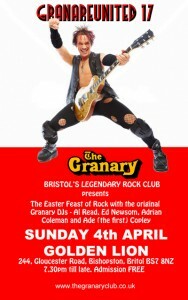 The Prom Music Bar is at 26, Gloucester Road, Bishopston, Bristol BS7 8AE Tel: 0117 942 7319. 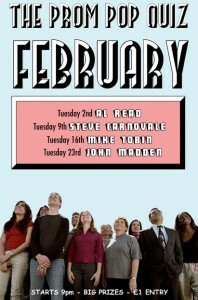 Al Read is quiz presenter on Tuesday 2nd February.